The IFCS World Team is holding an online auction through Monday, February 19th. There are many great items to bid on include agility one-on-one lessons with team members, books, dog leashes, toys and more! Check the auction out on their Facebook page at https://www.facebook.com/IFCSTeamUSAauction/. Help Fund the Team with Amazon Smile! If you shop online, did you know you can help fundraise for the IFCS Team USA? Using the AmazonSmile program, a portion of your sales will be directly donated to the U.S. team competing in the World Agility Championships in April, 2018. When the search is completed you should see the correct charity listed (see screenshot below). Click on the Select button. 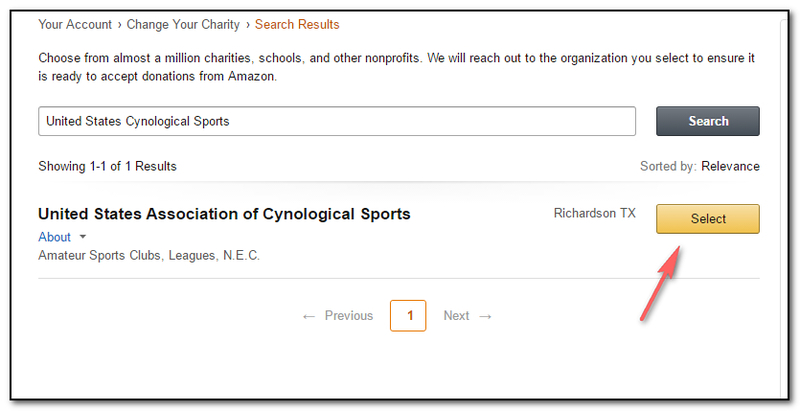 If you already are a participant in the AmazonSmile program and want to change your charity to the United States Association of Cynological Sports, just go to Smile.Amazon.com and look underneath the search bar for the word “Supporting” and the name of your current charity. 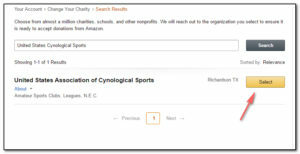 Click on the downward-pointed arrow next to your charity name to pop up more information. Click on the Change link and follow the steps above. That’s it! Easy! Now 0.5% of the purchase price of anything you buy at Amazon will be donated to the U.S. team! USACS is a tax-exempt, nonprofit corporation qualifying as a public charity pursuant to 501(c)(3) of the Internal Revenue Code, which permits public contributions to be deductible for U.S. federal income tax purposes since September 2014. USACS revenues are derived solely from public contributions and commercial sponsorships. The mission is to promote engagement in sports involving dogs through educations and participation in amateur national and international competitions.